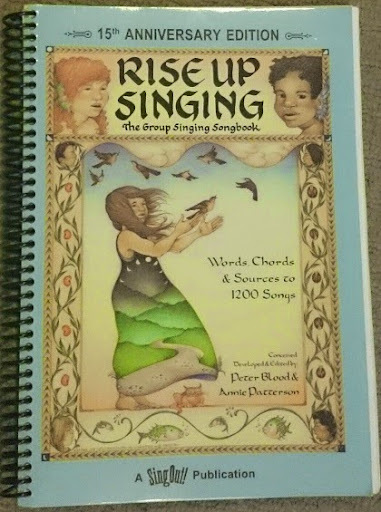 Rustling.org and "Rise Up Singing"
Rise Up Singing is a book which forms the basis of community singing initiatives all over the world. It was created by Peter Blood and Annie Patterson, and first published in 1988. It is supported by a set of teaching CDs that can be purchased separately. The book has received rave reviews all over the internet. Even the critical reviews admit that it's an outstanding collection, because it brings so much material together in such an accessible format. But it is always hard to decide whether to buy a book without knowing exactly what it contains. Some people are disappointed because of the Christian / religious theme of many of the songs, or because the book only has guitar chords (in its own special notation) but not a melody-line score for the majority of the songs. a listing of all the songs in the book, by title. Maybe it will help you decide that the book is for you, and therefore to buy it. But I will be happy if you decide that it's not what you're looking for, and that you should invest in something else and save the tree that would otherwise have given its life to making a copy that sits on your bookshelf, gathering dust. Over the years I have developed many other lists, templates, forms and guidelines are useful for people who organise group-singing. and now aims to be a general-purpose resource site for people learning about and leading group singing initiatives. This site has no affiliation with the publishers (The Sing Out Corporation), and does not receive any reward from them for any sales. associate, and may receive a few cents from them if you purchase the book (or anything else) after clicking on any of the Amazon links on this site. I may run advertising from other companies, including Google AdSense, on the site. All advertising and affiliate links on the site will be clearly identified. Use the comments form below to get in touch.